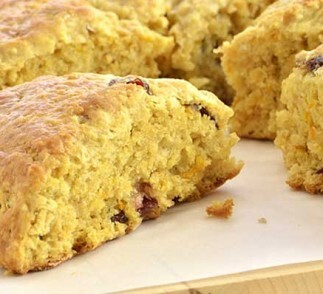 Our tender, flaky scones are dotted with sweet cranberries. Wonderful with a little butter, and the perfect addition to your Mother’s Day Brunch menu! In food processor bowl, add the flour, baking powder, baking soda, salt, sugar and orate peel. Briefly process to incorporate. Scatter the cubed butter on top of the flour mixture. Briefly process, until the mixture resembles coarse crumbs. Add VOSKOS® Greek Yogurt and the egg. Process just until a soft dough forms. If the mixture is dry or crumbly, add a tablespoon of water and briefly process again. Transfer the dough to a floured surface. 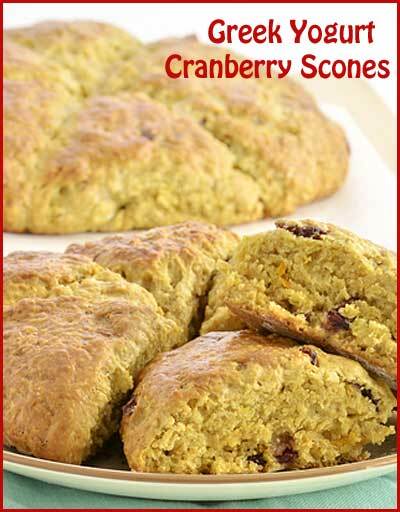 Gently knead, just a few times, kneading the cranberries into the dough as you work. Pat the dough into an 8-inch circle. Using a sharp knife, cut it into 10 wedges. Separate the wedges and place on the prepared baking sheet. Bake for 12-15 minutes, until golden-brown. Cool a few minutes on a cooling rack. Serve warm.